Streaming music platforms are booming nowadays. You have pretty much more choices than years ago. The most popular services include Spotify, Apple Music, Tidal, Deezer, Soundcloud. But obviously we can't listen to music from all sources at the same time. So the question here is what platform is more worth to choose? I have been a regular user of Spotify and satisfied with it. Recently I am trying to get some new music and come across with the Soundcloud. It works great for me. 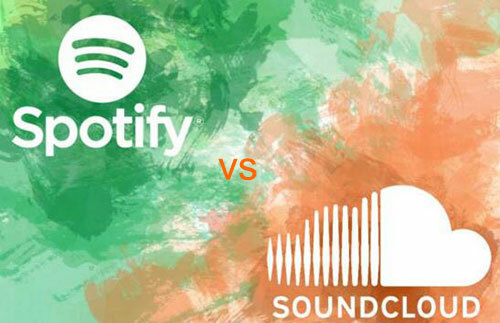 To help you pick up the best platform, today I'd glad to do a side by side comparison between Spotify and Soundcloud. Spotify offer two tiers of services, free and Premium $9.99/month. The free service let you access all kinds of music with occasional commercial ads. The Premium subscription removes all ads as well as a lot of great features like higher music quality, offline listening and so on. Soundcloud is originally known as a free streaming music platform until they release the Soundcloud Go and Go+.Go subscription charges $4.99/Month and the Go+ service costs $9.99/month. This service is to compete with Spotify and other paid subscription services. When it comes to audio quality, Soundcloud fall behind Spotify. Spotify free users can enjoy 160Kbps songs and the paid users can enjoy 320Kbps songs. For Soundcloud, the free user and Soundcloud Go subscription users can only enjoy 128Kbps music and the Go+ users 256Kbps. This is really low beyond average. Besides, the music quality varies largely from different artists or users. Spotify has 40 millions of tracks, 75 millions of users. This is not small. But Soundcloud has a pretty much bigger music catalogue and users base, 135 millions of tracks and 175 millions of songs. This is all because of the different business models of the two streaming music giants. Spotify songs are mainly contracted from digital music labels. Soundcloud music library are mainly generated by users. The more contents are uploaded, the more users will be attracted and visa visa. As for the paid subscription, Spotify supports to download up to 10000 songs for 3 mobile devices. Soundcloud will enable you to save as many songs offline as you want. Both Spotify and Soundcloud free services don't support offline listening. But don't worry. If you'd like to save money, you can use free tools to help you save any songs you want offline. Here are the top 5 free streaming audio recorders, just take a look at it. For Spotify songs, you can also use the shareware DRmare Music Converter for Spotify to help you batch download the songs losslessly with up to 5X speed. For more tips, you can visit: How to Convert Spotify to MP3. On Spotify free accounts, users can stream any songs for free, artists won't receive any fees. Besides artists can't control the access of the songs. On Soundcloud, artists and users can upload songs, remixes, podcasts freely as well as control over what Go subscribers can hear and what regular free users can hear. Both platforms offer the features for artists to interact with music fans. Soundcloud allows you listen to songs without even signing up an account. Just go to the website or the mobile apps to find the tracks or playlists you want and one click to play them. Spotify requires you to register an account. You can listen via the web player, desktop client, mobile apps. For the web player, you need to change the browser settings so that to make sure it is not blocked. Soundcloud combines style music and unknown interest musicians. Any users are allowed to distribute music to the platforms.You might come across some great tracks from that musicians with little fame. The disadvantage is that it is difficult to locate all the albums if you enjoy music from a special artist. Spotify provide a lot of mainstream music from different generes such as pop, rock, hip hop and so on. Besides, the powerful music discovery feature makes it easy for you to discover new music that you like. Soundcloud is a streaming platform which focuses on sharing audio contents you created and discovering new music for listeners. This makes it the exclusive platform with 175 millions of tracks. You will surely find the special remixes, podcasts that are not available on other platforms. Besides the Soundcloud Go+ which adds over 30 million premium songs, making it even better. Spotify is the most popular music platform which focuses on streaming mainstream music and generating kinds of personalized playlists.No matter what genre or mood of music you want, you can pick up it to listen to easily on your daily basic. As a music platform, the audio quality from Sound cloud is too slow compared to the main music platforms like Google Play, Spotify Music, Amazon Unlimited which all supports up to 320Kbps music. For Spotify, it has occasional ads. This is really annoying if you listen to Spotify songs for a long time everyday. And the songs are DRM protected, even if you subscribe to the Spotify Premium, you are only allowed to stream songs on 3 devices with 10000 limitations. The question to which platform is better depends your preferences. They are designed for satisfied the different needs of users. If you'd a music fan who want to build your own favorite playlists, obviously you should go with the Spotify. For the users who want to get some fresh contents to boost their energy as well as get something high, they should pick up Soundcloud. But giving the situations that both are offering free tier services, so why not just use both together? Still have any questions? Don't hesitate to let's know in the comment section below.